We love Halloween crafts over here and today's craft is probably my son's favorite. Simply collect random nuts, bolts, screws, washers, and nails. Then, give your child a hammer and a pair of these and watch him decorate away! My son's preschool class made these several weeks ago. All of them (boys and girls included!) had a blast decorating their pumpkins. I particularly loved this idea because the decorated pumpkins last quite a long time. We live in a fairly warm climate where carved pumpkins rot after a couple of days. This guy has withstood the test of time. We put him on our mantle about 2 weeks ago and he's still looking good. 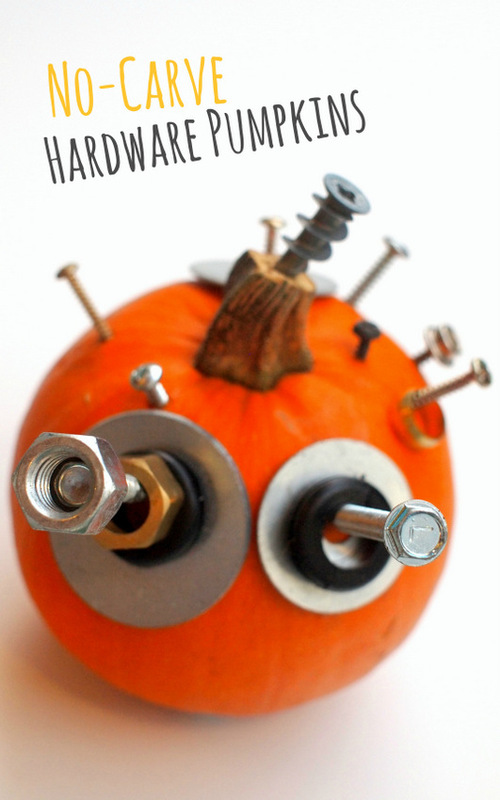 And if you like this craft....check out these other easy no-carve pumpkin ideas!